The South Dakota Legislature of 1901 established the State Historical Society and the Department of History of the State of South Dakota. One of the duties of the Department of History was “conducting a library of historical reference”. The library was first housed in the office of the Department of History in the State Capitol. --Session Laws of SD, 1901, Ch. 135, p. 228-233. Over the years, the state library has been housed in several different buildings and was even proposed to move to Madison at one time. The "state librarian" has gone by many different titles and there have been many highlights in the history of the state library. 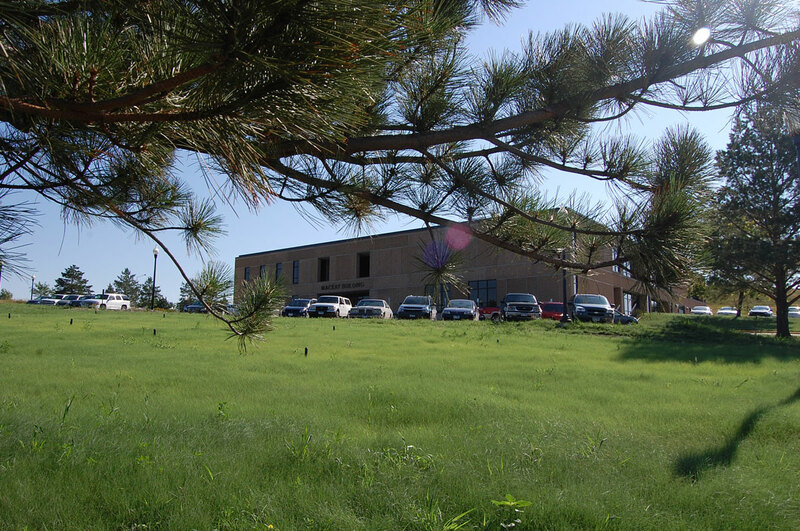 Since 1976, the library has been housed in the MacKay Building at 800 Governors Drive in Pierre. It originally occupied both floors, but in 2009 moved to solely occupy the first floor while the rest of the SD Department of Education (of which SD State Library is a division) moved from the Kneip Building to the second floor of the MacKay Building in 2010. • Library was first housed in the office of the Department of History in the state capitol. • Between 1918 and 1924, the free library was moved to downtown Pierre. • January 1925: a fire in the downtown quarters damaged about 8,000 books. • 1932: the library moved into space in the Capitol Building. (You can still tell where it was. The transom window over the door is etched, “Free Library Commission”). • 1957: after having again outgrown its quarters, the state library was moved for the second time to downtown Pierre into a grocery warehouse. • 1963: State Library Commission decided to move ahead with plans to acquire the old Pierre Post Office building as new quarters for the state library. • 1972: Legislature allocated $40,000 for the planning of a state library-supreme court complex. Plans for this building were eventually scrapped due to cost. • 1973: HB 832 was introduced in 48th Session of the SD Legislature (1973) to move the state library from Pierre to Madison and house it in Dakota State College’s Karl E. Mundt Library. The bill died in committee. In 1974, there was, again, a bill pre-filed to move the state library to Madison. • 1974: 49th Legislative Assembly of the State of SD appropriated two million dollars for the construction of a new state library building in the capitol complex at Pierre, thus ending the idea of a move to Madison. • August 19, 1975: groundbreaking ceremonies were held for the new SD State Library building in Pierre. • 1976: the state library moved from Fort Street to Governors Drive in Oct/Nov. The library did not close during the move. • 1993: a bill was passed in the 1993 Legislature to rename the state library building to be the Mercedes MacKay Building. • 2007: renovation started on the first floor of the MacKay Building. Once completed, the library operations moved to first floor, while the rest of the SD Department of Education (of which the state library is a division) moved to the newly renovated second floor in 2010. Over the years, the title of the person who was head of the state library has changed. It could be state librarian, director of the state library, chief librarian or other. Doane Robinson is considered to be the first state librarian. In 1912, Robinson was referred to as Secretary of the State Historical Society, Superintendent of the Department of History, and State Librarian. The Department of History managed the state library until 1913, when The Free Library Commission, created in 1913, took over supervision of the state library. (source: First Biennial report of the South Dakota Free Library Commission for the period ending June 30, 1914. The commission. Office, State Capitol, Pierre. Daily Sentinel Press, Madison, SD. Also see Session Laws of SD, 1913, Ch. 217, p. 301. • 1943: the South Dakota Free Library Commission title was officially changed to the South Dakota State Library Fifteenth biennial report of the SD free library commission 1942 p. 13. • 1975: SD State Document depository library system began. Robert Newby was the first Documents Librarian. • 1982: a library automation task force began meeting. SDSL hired a series of consultants to assist with the process of forming a consortium for library automation, later named SDLN (SD Library Network). In 1987-88, PALS (Project for Automated Library Systems) was introduced as the first library automation system in SD. • 1994: On June 22, 1994, the State Supreme Court ruled that video lottery was unconstitutional. That ruling caused Governor Walter Dale Miller to call a special session of the Legislature in which he identified potential cuts to state government to make up for lost video lottery revenue. Closure of the state library was one of the cuts proposed. Luckily, voters in the November election approved a constitutional amendment to authorize Video Lottery and the state library remained open. • 1995: funding for the Film and Video Library (a division of the state library since the mid-1960’s) was terminated during the 1995 Legislative Session. • 2005-2006: Dr. Mary Bushing was hired to do a study of state library services. The final report recommended bold changes and new directions for the state library. The library would gradually stop serving as a public library for the general citizenry of the state. Instead, it would focus on a new role as a statewide center to assist and improve local libraries across SD, assist SD state government personnel with work projects and research, and provide services through the Braille and Talking Book program. • A “splendid service”: the South Dakota Free Library Commission in the 1930’s. Lisa R. Lindell. South Dakota History, vol. 35, no. 3 Fall 2005.